The sitting was ably led by Msgr S. van Calster, the “delegatus episcopalis” – the bishop’s delegate on the Tribunal in the cause of this beatification process. Cardinal Eijk, Archbishop of Utrecht, who had left today for Rome following Pope Benedict’s abdication, had appointed Assistant Bishop Hoogenboom to represent him. 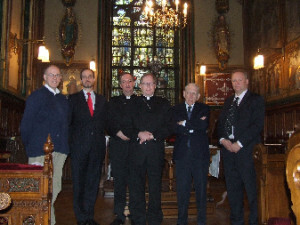 Also present were Father M. Schyns (promotor justitiae), Father A. Habets (notarius) and Mr W. Hilgeman, the vice-postulator of the cause, along with the members of the historical commission, the Friends of Dora Visser Trust and a number of residents of her birthplace Gendringen. Bishop Hoogenboom opened the sitting with the Gospel of the day, followed by the prayer for the beatification of Dora Visser. Then Msgr van Calster explained the procedure of the sitting, followed by an account of the origin of the case file. He concluded with the announcement that the work of the tribunal was rounded off in a positive way on 27 February 2013. 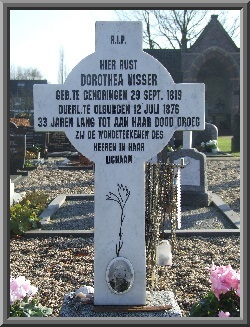 Msgr van Calster reported that from all the testimonies in the archives it appears that during her life and at her death and thereafter, Dora was considered to be holy. 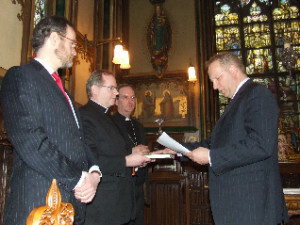 After the swearing of an oath by the members of the tribunal, followed by the checking, stamping and signing of the documents, Msgr van Calster was appointed “porteur”- the bearer of the case file to Rome. 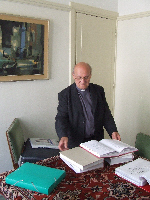 He will present the case file to the Apostolic Nuntio in the Netherlands, who will forward it to Rome by diplomatic post. This will prevent opening of the case file by customs, as the seal may only be broken in Rome. Then the documents – the original and two copies – were packed up and sealed. 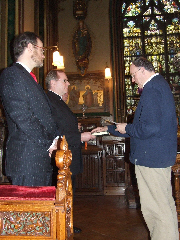 The original stays in the Archdiocese (Bishop Hoogenboom secured it directly after the sitting under lock and key); the two copies go to Rome. Bishop Hoogenboom then closed the sitting by announcing the appointment of vice-postulator Mr Hilgeman as postulator from 28 February, and wished him success and God’s blessings in his work. Together with those present he prayed the Prayer for the Election of a Pope, as found on the prayer card distributed by the Dutch Bishops’ Conference this week.